This home was built for Mrs. Anna Foster on land conveyed to her by Daniel Abbott in 1870. The home is built in the style called French Second Empire popular from 1855-1885. 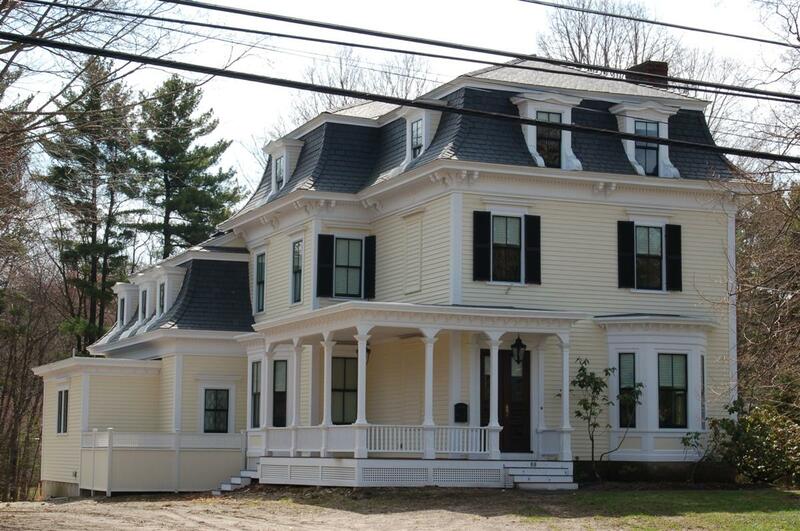 The mansard roof is the defining characteristic of the period style and many older Andover homes had their roofs converted to this high style look, most notably the America House on Main Street. The roof provided for an additional full story above the second floor but was taxed at a lower rate as it was still considered attic or garret space. The former side rear addition was completely gutted and replaced during the Christine & Curt Von Brawn ownership 2004-2010 with the sympathetic addition that mimics the original look of the house. The entire house and garage were also renovated and restored during construction and updated for 21st Century living. Samuel & Constance Fuller acquired the property in 1901 and the Fuller family remained the owners for 63 years before selling in 1964. Number 68 was Dr. Fuller's place. Yes, I remember the doctor but the one who leaves an impression was Mrs. Fuller. I recall her, even in her eighties and nineties, starting out for church or downtown, often for the mailbox at the corner of Phillips Street, with a firm, purposeful step. She lived to within three months of one hundred years. Her son, Sam, gave the carillon tower on the hill. Her grandsons Lester, Greenough, and Jimmy were my playmates when they visited their grandmother.